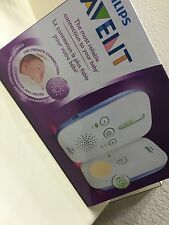 Philips Avent DECT Baby Monitor with Temperature Sensor - Excellent condition Condition is Used. Shipped with USPS Priority Mail. Philips AVENT SCD600 Digital Video Camera w Baby Monitor - Sight & Sound. Shipped with USPS Priority Mail. If your baby is restless when you put them to bed, you can help soothe and calm your baby to sleep with the warm tranquil glow of the night light or you can select one of five gentle lullabies. Customized temperature sensor. This baby monitor has been tested and is in good used condition. Lithium batteries are included. Your baby will love the star projector on the ceiling! Connection for MP3. DECT technology: 100%. 0 interference with DECT technology. The best start for your baby. because he needs the best products. In Very Good, Preowned Condition! Includes Parent Unit Charging Base With Power Adapter! We hope you Find what your looking for at the Right price HERE! In condition shown, described. If your baby is restless when you put them to bed, you can help soothe and calm your baby to sleep with the warm tranquil glow of the night light. The parent unit can be outlet or battery powered using AA batteries (not included). LED lights show you when the unit is linked and in range, and there is a backup battery function in case of power failure. Easy to carry. Wall mountable with automatic infrared night vision. Comfort your little one with the talkback feature, a night light or lullabies, while monitoring the temperature in the room. Energiesparender ECO-Modus mit Verbindungsanzeige. Kinderwagen & Kindersitze. Persönliche und sichere Verbindung mit anpassbarer FHSS-Technologie. Sa. : 10:00 - 14:00 Uhr. Hören Sie Ihr Baby mit klarem Ton. Great extras are the integrated night light and the lullaby mode. Hear every giggle, chuckle and hiccup in crystal clear quality. The parent unit notifies you when the baby monitor is out of the reception area or when the battery is low, so you can be sure that you are always connected to your baby. Capacity: 125 ml When you are comfortable and relaxed, your milk flows more easily. That is why we created our most comfortable breast pump yet: Sit comfortably with no need to lean forward and let our soft massage cushion gently stimulate your milk flow. Stay connected wherever you are. The uGrow smart baby monitor automatically switches seamlessly between WiFi, 3G and 4G to maintain a continuous connection to baby. Digital Video Baby Monitor. The ECO mode switches off the audio/video transmissions and the units only connect when the baby makes a sound. Enjoy your baby sleeping with the high resolution extra large 2.7" color screen. Advanced monitoring for you and your baby, with night light and lullabies, and with vibration alert and docking station for the parent unit. If your baby is restless when you put them to bed, you can help soothe and calm your baby to sleep with the warm tranquil glow of the night light or you can select one of five gentle lullabies. Customize the settings of the alert and a notification by a subtle and silent vibration of the parent unit. DECT technology: 100% privacy, 0% interference. Closer baby, less energy will be needed to achieve a perfect connection. Fully tested and working properly. You will get the item as pictured in retail box. Philips AVENT video monitor Range:500 foot range Frequency band:2.4 GHz Day and night monitoring includes infrared night vision and 100% private connection at a range of up to nearly 500 ft. Large 2.4" color video screen provides easy monitoring with high resolution images. Automatic screen activation-turns the video screen on when noise is detected in baby's room. Cordless portable parent unit with belt clip allows for complete freedom in and around the home. Soothing lullabies and nightlight comforts baby to sleep. The Avent baby monitor gives you the secure feeling to be close to your child. Due to its crystal-clear sound and the secure connection, which will be shown with a green flashing light. So you can stay calm in another room while your little Darling slumbers peacefully in his crib. Smart eco-friendly low power mode. -Always know if the monitor is plugged in and in range. -Sound level pilots indicate if the baby makes noise. -Range up to 50 m indoors ; range up to 300 m outdoors . Audio SCD570 w/Temp. AVENT DECT Baby Monitor. Talk Back Music and Light. Parent monitor is slightly scuffed. See Photos. Preowned baby monitor charging cradle and power cable. From a smoke free home. No reserve price. For details see pictures. Sold without any accesories, box or papers. Photos are current. You only received the item in the picture. It is color white.